How close can a prime lens go to the subject? My limit would normally be working from 3ft with a 35m wide angle. In my experience, a good rule of thumb is that the minimum focal distance in feet should – in 75% of circumstances – be a tenth to a fifteenth of the numerical lens specification and then the maximum should be double that. For instance, I would not normally tend to use a 85m lens at a range of 6ft or less and equally why use a 35m at more than 6ft? So if there is the possibility of exploring focal distance at 1.5ft without a fisheye lens, the 20m lens has a chance and the Nikon 20m F1.4m is an outstanding lens. It gives contextual detail with comfortable “bokey” and it gives portrait detail with eye grabbing clarity. If that is all a bit technical, I apologise but photography is rarely not about maths. Of course it is about emotional employment and personal soul, but Ansel Adams was a mathematician first. Practitioners should understand how light enters the camera and also how lenses work. On social media, “The Hunger Games” quickly became our most loved image. Followers talk about my implicit bravery and stupidity, but they are wrong. It is a picture about access first, then maths and experience. I was no cavalier hero. The Revenant was mostly shot by “Chivo” using the same mathematical proximity rules and it won him an Oscar. Here is the story. 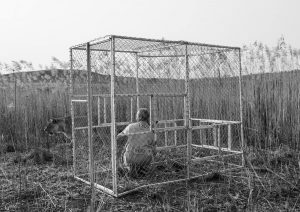 I am in a bespoke cage (below) in Transvaal, South Africa. The beautiful lioness emerges from the high grass and is immediately inquisitive of me and my smell. She peers through the gap that is my shooting window in the cage, but she can’t get at me. It a perfect chance to take a portrait of a lioness in her natural environment – just as my fellow Scot – Albert Watson – would photograph a model in New York. Of course her nose was too close to be truly sharp – there is no depth of field at that 1.5ft range. But everything else in her face offers detail never perhaps previously seen with such clarity. It was a proud moment.